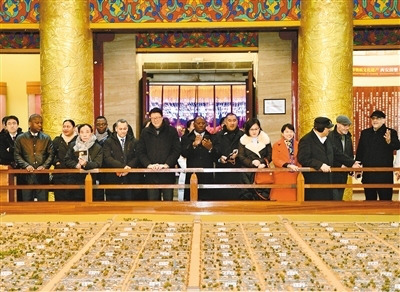 On Feb 27,a delegation of diplomatic envoys to China from 11 countries, including Albania, Bahrain, Ecuador, Gabon, Jamaica, Suriname, Samoa, Chile and Iran, participated in the activity of "Xi'an Ambassador's Day in 2019" at the invitation of the Xi'an municipal people's government. On Feb 26, the Xi'an International Trade and Logistics (ITL) Park carried out a compulsory demolition of the Senyuan garden planting center, an illegal shed built by Xi'an Senyuan Agricultural Development Co,. The historic city of Xi'an will promote the integrated development of culture and tourism this year, so as to further expand its cultural influence in the world. The Xi'an International Trade and Logistics (ITL) Park has set up an integrated management system–known as a "general grid"–to manage the 41 villages and communities under its administration. Xi'an, capital of northwestern Shaanxi province, has vowed to reach new heights in 2019 with a package of economic and social development goals. Xi'an International Trade and Logistics (ITL) Park launched Shaanxi province's first government affairs service spot,"Louxiaoer," achieving the promotion of the government service of Shaanxi Pilot Free Trade Zone (FTZ).